Designed to be combined in an N+1 fault-tolerant power system. Front panel voltage adjustment trimmer for adjustment of output voltage. Built-in forced current sharing and or-ing diodes. May also be used independently as a multi-output power supply. Designed to be sustainable - new models are backward compatible with existing racks. Available in 1U and 3U sizes. Mounts in 19-, 23-, and 24-inch equipment racks. All models include power factor correction (PFC). Full service customized DC power distribution systems can match power supply output(s) with your load(s). I/O connections via 24 pin connector that plugs into rack adapter. External connections are made via rack adapter. Surface mount technology permits minimum mounting space. Entire RA 19 racks populated with HSF power supplies can be connected in parallel, parallel-redundant or series. HSF are CE Marked per per the LVD, EMC and RoHS 2 Directives. See applicable Declaration of Conformity. Watch video of NEBS GR-63-CORE earthquake and office vibration testing. When HSF modules are paralleled, the module with the highest voltage setting automatically becomes the "master." As long as they are in the same voltage range, the other units are slaves, tracking the master voltage setting and equally sharing load current. Additional Fault Tolerant Solutions with Kepco's Series HSP (hot swap) and HSM (hard wired). 3.3V, 5V, 12V, 15V, 24V, 28V and 48V models. Kepco's Series RA 19-1U Rack Adapter. Use the RA 19(X)B Series Rack adapters (hold various combinations of 1/8-rack (50W and 100W) and 1/6-rack (150W) units. For combinations available refer to the RA 19 Rack Adapter. Kepco's Series RA 19-6B Rack Adapter. 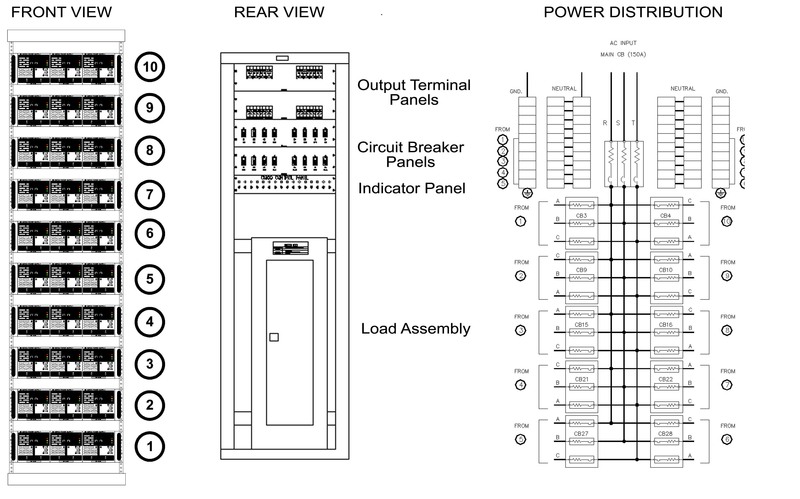 Remote voltage programming capability (standard), voltage measured at front panel test points. Reset button restores output after sensing an over- or undervoltage condition, thermal overload, or fan malfunction. HSF 300W and 600W Series are offered in 5V (300W only), 12V, 15V, 24V, 28V and 48V models. HSF 1200W/1500W Series are offered in 24V, 36V and 48V models. Contact factory for details regarding options not listed on the associated BUY NOW page. A full color brochure for Kepco's Hot Swap HSF and HSP models is available for download. Kepco can also provide full service customized DC power distribution systems to match the power supply output(s) with your load(s).